With a record of community service too extensive to detail, Dean and DonnaJean Wendle have devoted countless hours to bettering our community for more than three decades. After serving in the U.S. Navy, Dean retired at the rank of captain and moved forward with what became a distinguished career in commercial banking. Meanwhile, DonnaJean raised the family’s five children. The couple moved to Josephine County in 1981. Ever since, they have continuously contributed their time and energy to local education, economic and other community building organizations. Currently, Dean still serves on the RCC board as well as the Oregon Community College Association Board and Executive Committee and Southern Oregon Regional Economic Development, Inc. (SOREDI). DonnaJean chairs the Southern Oregon Education Service District Board and the Josephine County Housing and CDC Board, in addition to serving on the boards of the Josephine Community Libraries, Josephine Community Transit and Kairos. 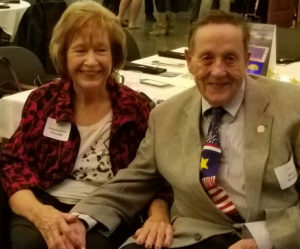 Member and honorary member respectively, Dean and DonnaJean take part in the Grants Pass Rotary Club. As a couple, they have also received the 2005 Rogue Community College Distinguished Citizens Award and the 2010 Asante Foundation Award for Education Contributions. Selected non-profit: Josephine Community Libraries, Inc.